Chestnut colt by Gold Luck. Judge's comments at foal inspection, "He moves like a king and only out of courtesy does he touch the ground." SOLD! Congratulations to Nancy Lewis Stanton! January 2009: Ghlenlivet has his first cover photo on the AHS magazine winter 2009 cover! Lake Erie College Dressage March 14-16/2008- Ghlen did the 4-1 and was first place with a 66.279%. In the 4-3 he was first with a 65.610%. He was also first in 4th 2 with a 67.727%. He was high point 3rd and 4th level. Fall 2007-Ghlen has had a very successful year. Nancy tells me that he has her so spoiled, when he gets below a 70%, they say he is having a bad day. He is first in the All Breeds award for the AHS for 3rd level with a score of 69.151%. He also leads the musical freestyle list for the AHS. 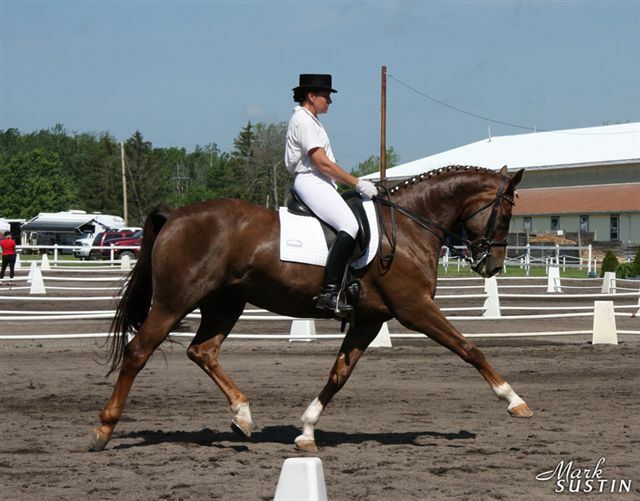 Nationally, he is placed 7th in the dressage Horse of the Year for third level, and is ranked FIRST nationally for musical freestyle. 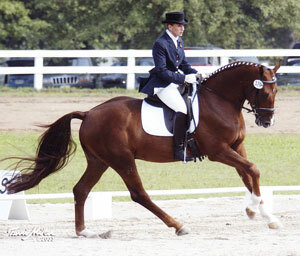 He and Nancy have competed a few times at fourth level test 2, receiving scores from 67-71%. Congratulations, Nancy, and good luck with your "new baby", Rhigatoni! Well, it looks as if Ghlenlivet will be ranked "only" 14th nationally for 2006 with a score of 68.056%. Not too bad for a horse that has moved up a level every year shown and been ranked in the top 10 nationally every year he competed! Well we are all set to come to Devon. We will be there on wed. in the afternoon sometime. Rhavel shows on fri. an sat. I don't know times, they are a draw. Region 2 finals went well. Ghlen was 5th at 3rd level. One flying change was the difference. It was that close. Rhavel got scared before his PSG. He did everything but was very tense. We had a 55. The I-1 was better except for I went off course, walked thru a piroette and missed both sets of changes. He had a 60. They were very good and I had a blast. Congratulations to Nancy Lewis-Stanton and Ghlenlivet. At the Dressage at Stone Tavern and Region 1 Finals at the Horse Park of NJ on 9/ 2-6, they won the Region 1 First Level Championship with a 71.250% and they won the Region 1 Championship for First Level Freestyle with a score of 71.66%. 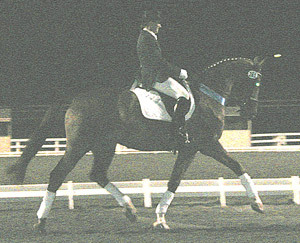 In the open show, they won their First Level Test 4 with a 72.5%. 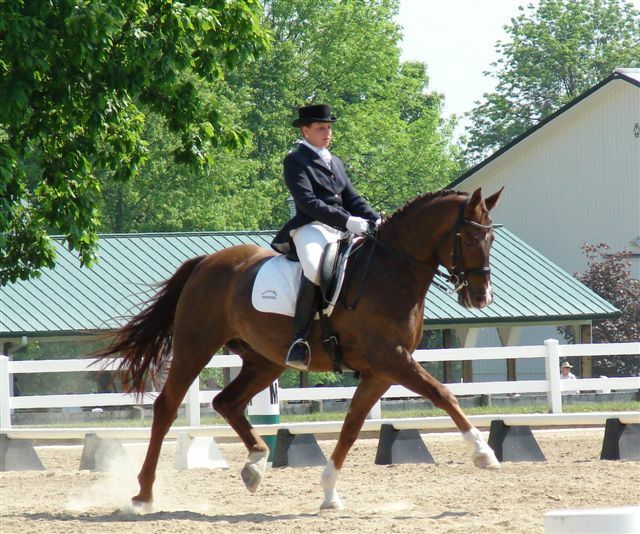 ...Nancy Lewis-Stanton of Chardon, Ohio, earned the high-point honors on her Hanoverian gelding Ghlenlivet. Judge Wayne Quarles filled her Open Training Level, Test 2, score sheet with one 10 and seven 9s, including a 9 for rider's position, which added up to a whopping 81.92 percent. "I'd like to say I can take all of the credit for the score, but he has an enormous amount of natural talent," said Lewis-Stanton. "What surprised me was that he behaved so well in the ring and didn't spook. Especially because he nearly cleared the warm-up ring when he leapt straight into the air." This was only the 4-year-old's fifth show, and he had part of the summer off because he was gelded late. "I spent a lot of time just becoming friends with him and earning his trust," said Lewis-Stanton. Next year she plans to bump him up to First and maybe Second Level. "He's got a huge canter, so as soon as I can collect him a little more, I'll be able to do a 15-meter circle," she said. 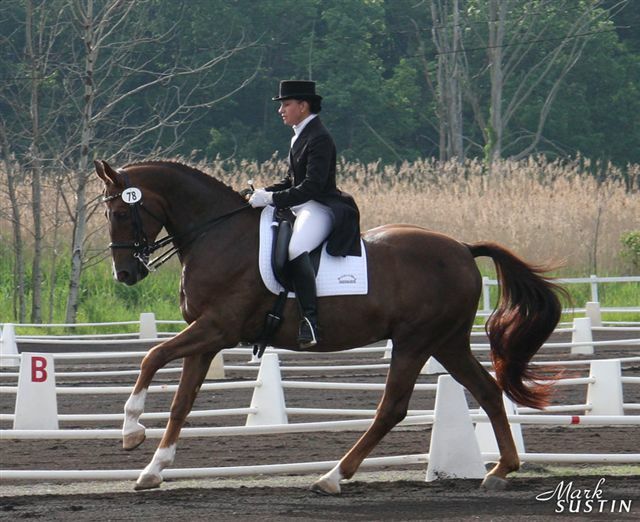 At the Grand Haven Spring Dressage Show in Jefferson, OH on 4/30 and 5/1, they won all three classes entered. 2nd 77.632%; 2nd 2 69.189%; and 2nd 4 66.667%. This was his first time showing at 2nd level. At the Dressage at Stone Tavern and Region 1 Finals at the Horse Park of NJ on 9/ 2-6, they won the Region 1 First Level Championship with a 71.250% and they won the Region 1 Championship for First Level Freestyle with a score of 71.66%. In the open show, they won their First Level Test 4 with a 72.5%. 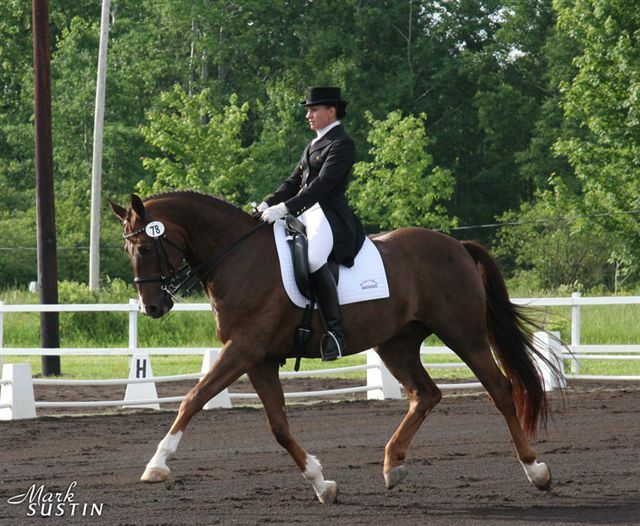 Ghlen and Nancy won both of their classes at the Prix de Ville North America show in Painesville, OH on 4/16-18. First Level Test 2 - 67.059% and First Level Test 3 - 67.714%. 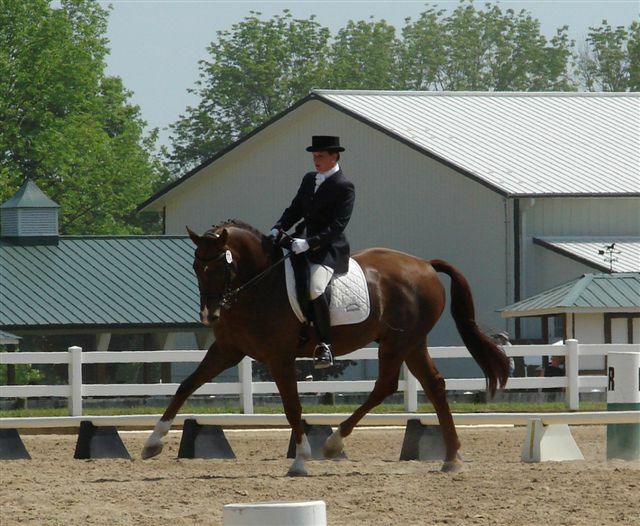 Ghlenlivet and Nancy Lewis-Stanton won first level qualifying at the Lake Erie College Dressage show on March 19-23 with a 72.77%. They won all 4 of the classes they entered: First 1 (70.74%); First 2 (66.176%); First 3 (74.286%). 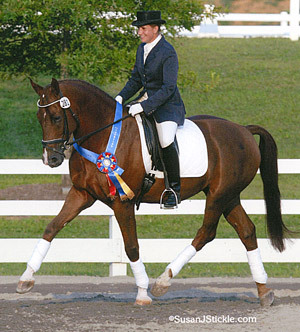 Ghlen received rave reviews after being used as a demonstration horse at the 2003 USDF dressage symposium. He was mentioned in two national magazine articles. 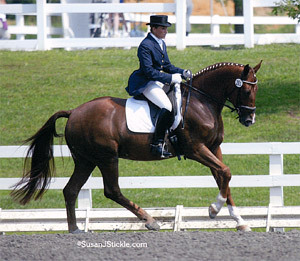 Paxton Farms Show, May 2003 - Nancy and Ghlen were First in Training Level Test 4 under Jessica Ransehaussen with a score of 77.692% (!!!) receiving a "9" on gaits. Jessica told her that she was thrilled to see Nancy on such a spectacular horse and that she must take really good care of this future superstar! 2010-Ghlen had another set back. Not too major I hope. When we first did his whole work up in the spring the vet said he was very slightly neurologic. I've noticed in the past few weeks that he is dragging his front toes in the sand. I thought it was from his toes being to long so last week my farrier was out along with a client who is also a very good vet. He was sore in both front feet and the more we did the weirder he got. So after another neurologic exam we determined he has EPM. She suggested to rule it out put him on a high dose of sulfa pills over the weekend while we were at the show and if he showed any improvement that we would order the Marquis this week. He did show improvement, which is good. I think we caught it very early. Her theory is that when he had his episode in the spring it triggered the EPM. I cried all weekend, up until Toni got his 70. I've noticed he hasn't been his wild self in the pasture. So things about his behavior started to make sense. He is not falling down nor do I fear riding him. He has had this week off to let his feet get better and I will start him back to work next week. I'm still holding out hope that we will make it to finals, we're going to New York next month. Everyone thinks I'm nuts to try but he has been working this whole time. I will make the decision the week we leave if he goes or not we have a month. If he is not himself and has a chance to win I will not take him. He's too good to just go to go. If he continues to do well I may still ride him. I don't know. Rhavel is fine. I swear he's indestructible. We actually had a 69% on our freestyle a few weeks ago. 7-2008 We had another good weekend. Rhavel had a 65% at I-1 and a 57% at the GP. Ghlen had 2 62% at PSG. They were very good. Ghardener won his first class. turning out to be very nice. I now own 2 FEI horses. Ghlen did the 4-1 yesterday and did alright, he only had a 75%. today we did the PSG. He was so good!!! He had a 70%! We even got an 8 on the 3's. He of course won the class. He has the 4-2 tomorrow.Rhavel is now a Grand Prix Horse. He was so good. I think we finally found something he likes. He had a 60%. We had some little mistakes in the 2's and the zigzag. We did get all 15 1's. He even had enough energy to do the last center line. Yesterday we did the I-2. He had a 62%. He tried to over achieve and did 15 1's even though I stopped at 11. We do the GP again tomorrow. I should ride better. thought was a little low. He was very well behaved.I'll call you monday to give you all the details. I'll have Sharon send some pics. I can't believe Rhavel finally got there. It's been a long road. I don't think two many people would have put up with him. He does his piaffe and passage with his ears forward. I think he is happy he is aloud to prance around the ring. He's been waiting 10 years for that. thanks for breeding such great horses!! !I better go shower. I'll call Monday. 7/30/07-I took the 2 boys to a show over the weekend. they are doing so well. Ghlen had a 71% at 4th 2 and a 72% at the freestyle. rhavel had a 68% at the I-1 freestyle and a 65% at I-1. We have another show in 2 weeks then we are done until finals. We are going to Virginia in Oct. Talk to you soon! Well we did it. Rhavel got a 64% and a 67% at I-1. So I sent our entries to Devon. So I hope our PSG scores are high enough. I'll know in a couple weeks if we got in. He was finally good thru out the whole show. Our next stop is the regional finals. That will be a good test of his behavior. i hope that breeding season is going well. The boys are having a good summer so far. We took him to the Paxton CDI a couple of weeks ago. He did great. A 69% at 3rd one and a 70% and 72% at 3rd 3. He got 2 first and a third with the 70. He was reserve champion 3rd level behind Dr Cesare Parra and his young stallion Furst Fabio. He even beat the horse once. Yeah Ghlen. The first time I saw the horse I thought it was a FEI horse. So needless to say we are qualifed for the finals. I am going to show him in July and maybe to a 4th level with him. He is getting 8's on his changes. We are going to Waterloo MI this week to work with Carole Grant and then to the Waterloo show. Hi Mo, Looks like you've been busy. I thought I would give you an update on the boys. It has been such a long winter. Rhavel [also purchased from RSF] is now an FEI horse. He did his first 2 PSG's this last weekend. We didn't do to bad 59% both on Saturday and Sunday. It is amazing what 2 years home working can do mentally for a horse like him. He was actually well behaved, no playing in his stall, rearing and bucking. He walked around almost like a gentlmen. He isn't quite confirmed in his changes yet but they are coming. Ghlen picked up right where he left off last year. A 69% at 2nd 2, 66% at 2nd 4, and a 77% at 2nd 1. Of course he won all his classes. We left before the high point ribbons were handed out, but I think he should have been high point. He was so good. He didn't look at anything. I think Devon was a big wake up call for him. So he shows again in a couple weeks. I'm trying to get the changes on him. he has the idea just can't quite put it all toghether. He is doing everything for the 3rd 1 but the changes. I hope by the end of summer we can move to 3rd level. We'll see. Fendi is still forsale. I have some people that are supposed to come out this weekend. Maybe they will like him. I'm keeping my fingers crossed. I showed Greg a baby tape of Doc today, still interested if he is avalible when we sell Fendi. I was just going thru my latest issue of USDF Connection (December 2003) when I found them talking about Ghlen. The article is "The A's Have It". In it, Janet Brown says, "Now we are seeing horses with three expresive gaits and beautiful necks, heads, and bodies-really beautiful types. This weekend [September 3-7] at the Region 2 show, several of the judges - all FEI officials - gave one horse [scores of] 78 to 82 percent. 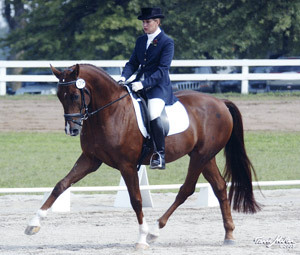 It was a four-year-old Hanoverian in Training Level, but with the balance of a Third Level horse and "8" gaits. What fun! Good gaits, beautiful body, and a mind to match!" They never mention his name but he was the only horse there to get those kind of scores. Ghlen is doing great. I will be moving him to Second and Third Level next year. If all goes well I would like to try for the 2007 Pan Am games with him. That is alot of if's but we have a goal. I don't think I'm going to show Rhavel [also purchased from RSF] next year. We are just going to train and come out PSG and I-1 the following year. He can piaffe already. I've been working half steps with him and he just piaffed one day. I thought he did something wrong when he got so springy. He is so different then any horse I've ever worked with. I'm learing alot. So that is it. Have a great holiday season. Ghlen's pictures are on the way.